The first Chinese car of the Great Wall Voleex C10 model to be produced in Bulgaria is setting the start of a new advertising campaign, announced Litex Motors, the Bulgarian partner of the Chinese producer Great Wall Motors. The first Bulgarian-made Great Wall Voleex C10 will become a present to one of the participants in an interactive game to be conducted on Facebook. Instead of the "Made in Lovech" ("Made in Ловеч") slogan (Lovech is the northern Bulgarian city that hosts Great Wall and Litex Motors' manufacturing operations in Bulgaria), the promoters are now introducing the "Made in Bulgaria" ("Made in България") slogan for the Chinese cars to be assembled by Litex. 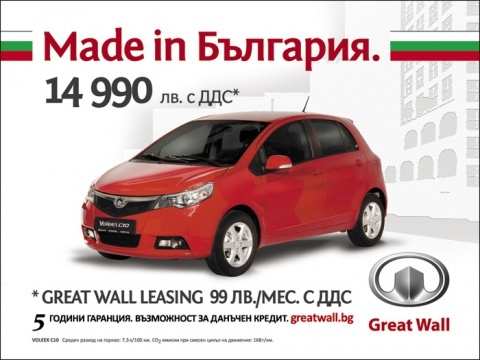 The start of the Bulgarian production of Great Wall Voleex C10 will allow for the model to be offered on the Bulgarian market of BGN 14 990, VAT included, (about EUR 7 500), or to be leased with a BGN 99 monthly payment. Bulgarian company Litex Motors and its Chinese partner Great Wall Motors plan to produce 50 000 cars per year within five years; manufacturing operations in the car manufacturing plant in the village of Bahovitsa near Bulgaria's Lovech started in late 2011-early 2012. The produce of the Lovech plant is already on the market in Bulgaria, Macedonia, Albania, and Montenegro.